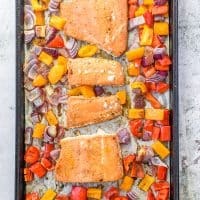 You can have this sheet pan salmon and veggies dinner on the table in under 30 minutes — a perfect sheet pan recipe for busy weeknights. When it comes to weeknight dinners, quick and easy recipes are the best. Sheet pan dinners and casseroles are my favorite for weeknights, because they are quick and easy to prepare. You just throw everything together and let the oven do all the work. Plus, less dishes to clean up after dinner is icing on the cake. 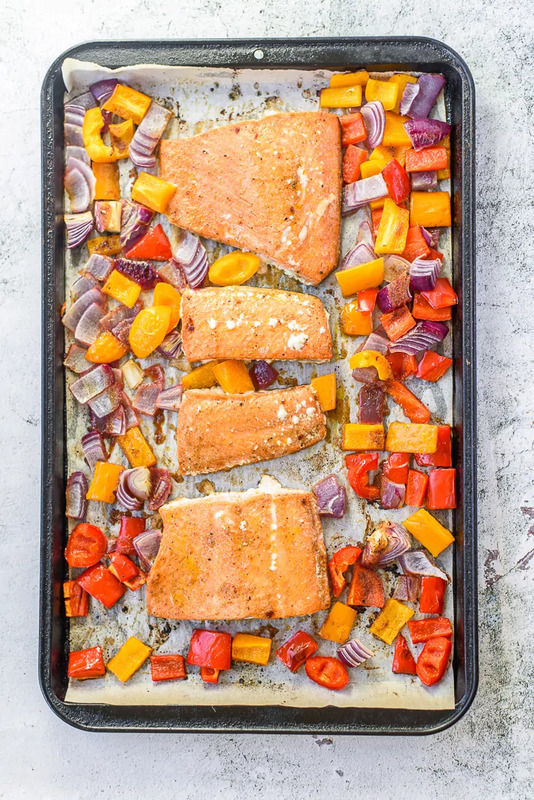 This sheet pan salmon and vegetables recipe takes just over 20 minutes from start to finish. Now that's what I call a quick and easy dinner. And the chili lime seasoning — oh. my. goodness. It is so good you guys. If you would prefer a more mild chili lime seasoning, you can go easy on the red pepper flakes, or omit them from the recipe entirely. 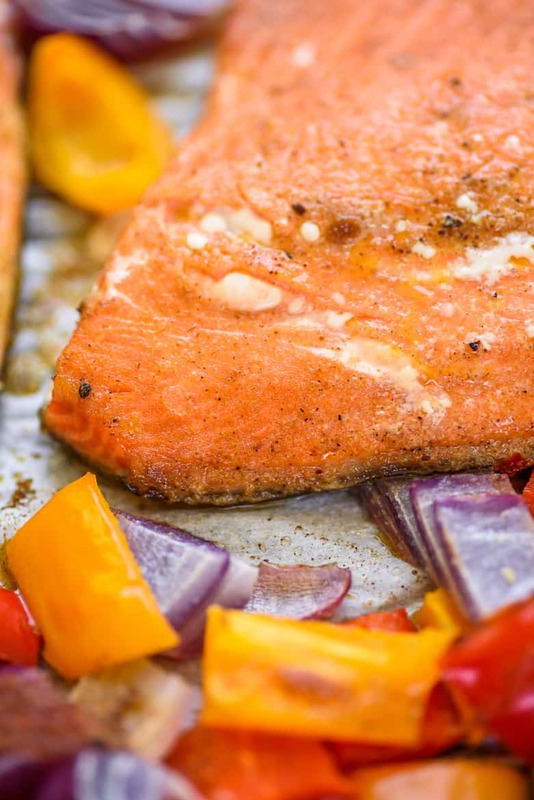 Or if you wanted a different flavor seasoning, you might enjoy this herbed lemon salmon recipe. 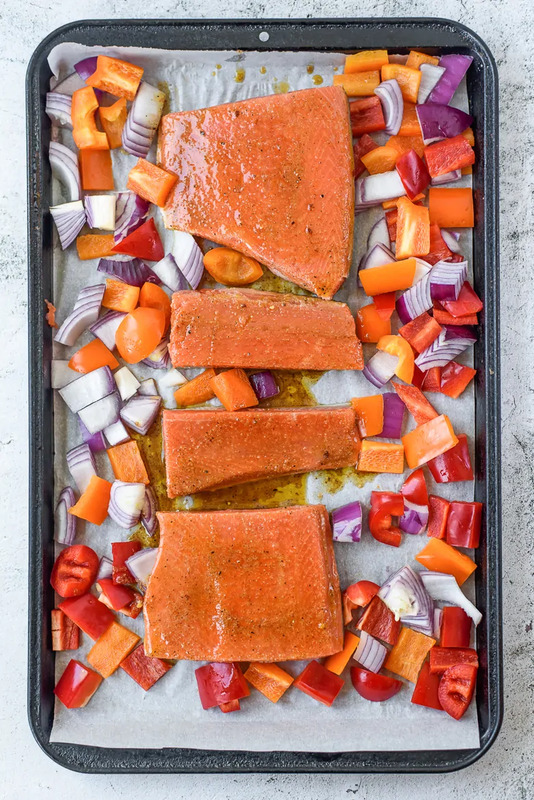 Okay, so I sold you on this sheet pan salmon recipe and now you want to know how to make it. 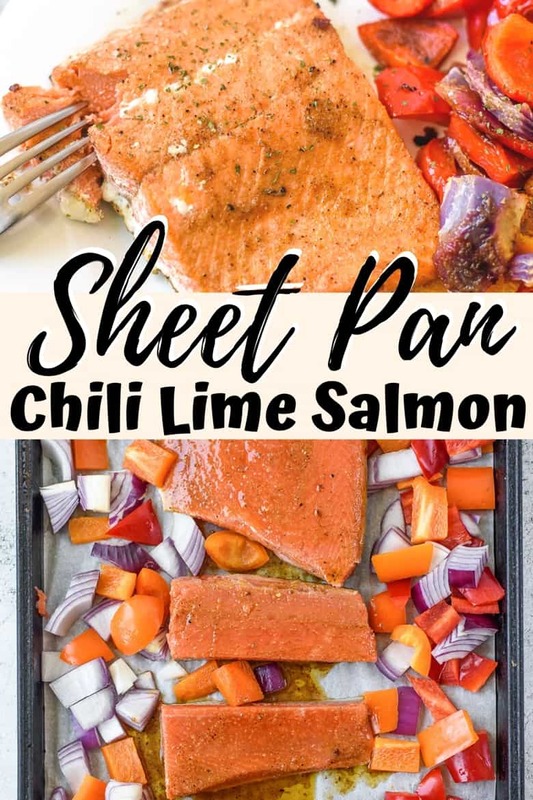 Place salmon and chopped veggies on a prepared sheet pan. Whisk chili lime seasoning ingredients together in a bowl. Pour or brush seasoning on to salmon generously . Bake for 10 minutes, then broil for 2-3 minutes. Serve as is, or with rice if you would like to add to the dish. Perfectly seasoned chili lime salmon baked in a sheet pan with peppers and onions. Preheat oven to 425 degrees. Line baking sheet with parchment paper or foil, and coat with cooking spray. Lay salmon filets on sheet pan. 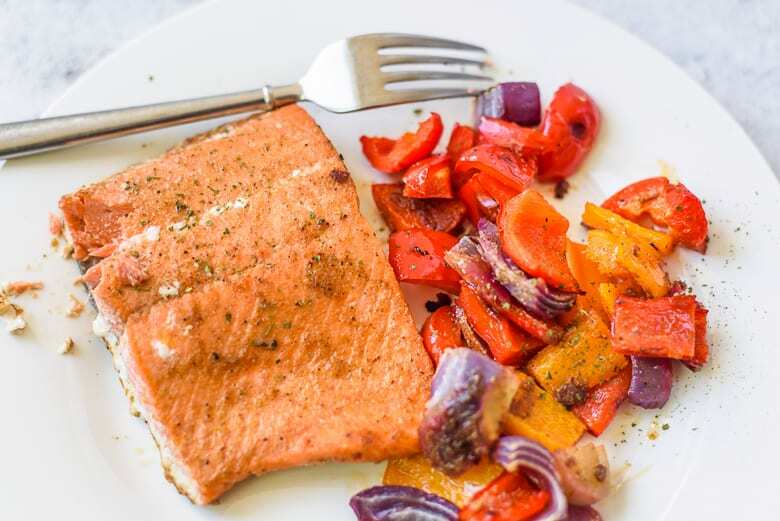 Add chopped vegetables to the sheet pan around the salmon in a single layer. Mix remaining ingredients in a small bowl and whisk well. Pour or generously brush seasoning on to salmon filets. Place sheet in preheated oven for 10 minutes. Turn oven to broil and allow to cook for 2 - 3 more minutes. Serve with rice, or just as is. Enjoy! This recipe was shared over on The Weekend Potluck and Meal Plan Monday — be sure to pay them a visit for more delicious recipe ideas. Big fan of one pan dishes! Pinning!